An equal parts romantic and disturbing solid effort from the prolific New York outfit. In print, the above Yellow Ostrich lyrics are a bit unsettling, made all the more unnerving in song by a honey coated harmony delivery. It’s fairly common in the indie world to come across songs with upbeat structures hiding depressing lyrics (see everything ever written by The Shins), but Yellow Ostrich play a much more disturbing game. They’re more in line with St. Vincent and Radiohead, disguising dark lyrical themes under cloaks of mesmerizing singing and instrumentation. 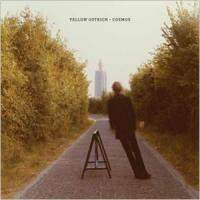 Yellow Ostrich are a hardworking bunch. The New York outfit have released four albums since 2009, including two in 2010. They’ve been sharpening their sound over the last few years and, with the official inclusion of touring members Jared Van Fleet and Zach Rose (following the departure of Jon Natchez), they’ve gained some muscle in the studio. Alex Schaaf’s blazing guitar lead on “Shades” is beefed up by Michael Tapper’s fantastic drumming and Van Fleet’s extra guitar. Having two guitars on the record allows Cosmos some extra room for genre hopping. “Any Wonder” is surprisingly heavy and “Neon Fists”, one of the album’s best pieces, is aided by dancing guitar lines as well as a mix of electronic and acoustic percussion. The only thing more entrancing than the guitars on that track is Schaaf’s vocals. His boyish voice is the key to a good handful of these songs. Not only is it beautiful -- especially in the case of tight harmonies -- but it also serves as one of the main ingredients that makes Cosmos delightfully disturbing. Not every song here is guaranteed to go down smoothly. The massive chorus of “How Do You Do It” is either the album’s biggest moment or an out of place burst of excess, and “In the Dark” meanders into near ambient territory. Still, even with these weaker pieces Cosmos is a well-crafted and well-produced album. It can seamlessly shift from soft floating segments to sections of sudden weight. Opening track “Terrors”, along with the outro to “Neon Fists”, exemplify this perfectly. With the combination of youth, great work ethic, and a thirst for experimentation, future releases from Yellow Ostrich might be some of the most exciting stuff in the indie-rock world. For now, Cosmos acts as a solid standalone album with an occasional lack of cohesion. It’s hopefully a peek into Yellow Ostrich’s future.